Capilano Volkswagen is proud to support all Federal Civil Service employees! 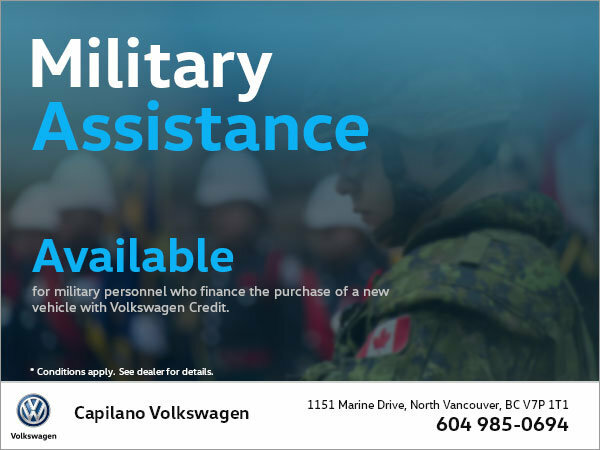 Capilano Volkswagen is a subscriber to the Military Assistance Corporation (MAC) and wants to help full-time military personnel. When Federal Civil Service employees finance the purchase of a new vehicle with Volkswagen Credit, Capilano Volkswagen will help to simplify the payment process! For more information or to inquire if you are eligible, please contact us today. It's Capilano Volkswagen's way of saying thank you!